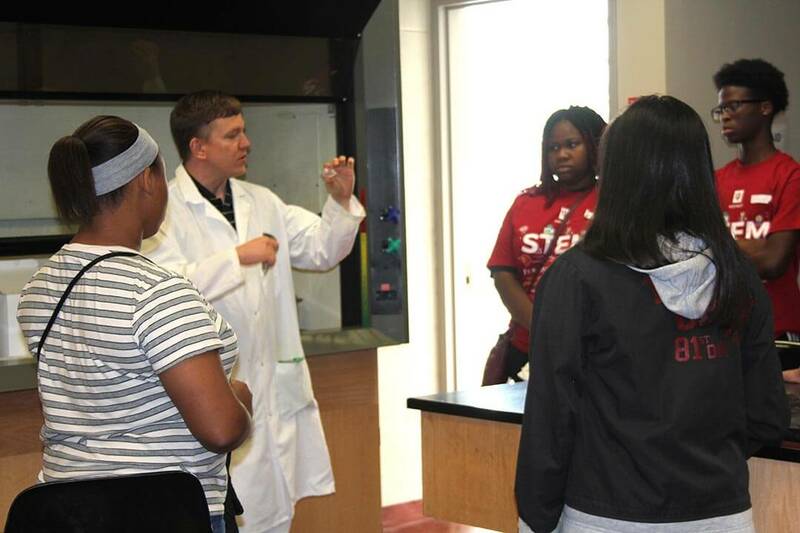 Thirty-five teens from area high schools spent time at Indiana University Northwest this summer, immersed in hands-on learning in science, engineering, technology, and mathematics (STEM). The three-day camp was provided free of charge, thanks to the National Science Foundation's (NSF) Louis Stokes Alliance for Minority Participation (LSAMP) program, designed to increase the quantity and quality of students, especially underrepresented students, who study STEM disciplines, and boost the number of STEM graduates. 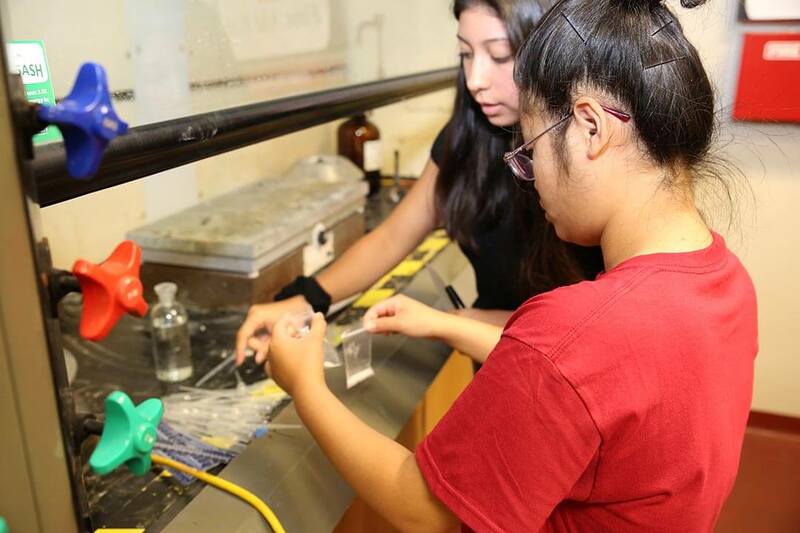 Tina Lin, right, and Andrea Hernandez, prepare to conduct an experiment. The teens rotated through various activities and experiments in biology, chemistry, computer information systems, informatics, math, and geology. IU Northwest faculty members, all leading researchers in their fields, had the students designing, problem-solving, analyzing, experimenting and more. Lecturer Linda Wozniewski challenged them to figure out how much weight their bridges could hold. Professor Zoran Kilibarda helped them determine the geographic origin of beach pebbles. With Assistant Professor Dan Kelly, the students created a chemical reaction with vinegar and baking soda to design an air bag system with a weight. Associate Professor Jie Wang helped them create a framework for 2D game development. And they learned about actuarial science by working on brain teasers with Professor Vesna Kilibarda. Assistant Professor of Chemistry Daniel Kelly explains the day’s experiment to his group. Their task was to create a chemical reaction using vinegar and baking soda to determine a weight limit for their air-bag system. Opportunities like IU Northwest’s Summer STEM Camp, and other initiatives made possible by LSAMP and other NSF-funded programs, help students develop their interests and discover passions that ultimately fuel their desire to pursue careers in STEM fields. The IU Northwest Summer STEM Camp is now in its second year. Palmer is one of those students positively impacted by this early exposure to STEM fields. In college, she intends to pursue biotechnology. Merging her interests in both computer science and biology, Palmer is interested in incorporating technology into the body, such as prosthetics that can be controlled by the brain.